Due to high unemployment in some industry sectors and certain regions it isn't easy to find a job in Germany - especially for foreigners. In addition to the Business German courses at Sprachinstitut TREFFPUNKT there are some seminars offered, e.g. Successful Job Applications in Germany. 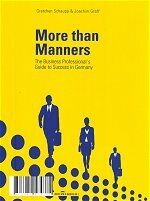 Also the book "Business-Etikette in Deutschland / Mind your Manners" (see below) will provide you with many tips for your job application. New Strategies for the Job Hunt: When looking for employment, it is important to take advantage of all available sources, ranging from job offers in newspapers, magazines and online job-fairs, to trade fairs, the German employment agency and personnel consultants. Furthermore, you can draw a company's attention your special skills by sending "blind" applications. How to Read Job Advertisements: Job advertisements often contain more information than you might imagine at first sight. Hence, it is important to read carefully and to interpret the given information correctly. Learn about the intended but often hidden meaning of typical phrases and standards and how to react to job advertisements in an appropriate and successful way. The Job Application: Since every country has its own standards and types of application, you should thoroughly acquaint yourself with the respective guidelines: Which documents are required? Which aspects do you have to consider regarding content and style? In our book you can particularly read about the standards of application in Germany. Questions and Answers for the Job Interview: You should be prepared for a certain standard procedure, but also for tricky, unexpected questions. In these situations, a spontaneous and adequate reaction is crucial, as well as keeping calm. Learn more about the Do's and Don'ts in a job interview in order to avoid putting your foot in it. The Job Reference Certificate: This important certificate about the success and quality of the applicant's previous work is appreciated by nearly every employer. Our book tells you which information needs to be included, which formalities are to be considered and why timing is so important. We appreciate comments and suggestions. Please write to: info@learn-german-online.net.